I came across this Pileated Woodpecker 5 feet off of the road driving to Housekeeping Camp which is located in the valley of Yosemite National Park. She was working a cedar tree as I drove up, I was so excited to finally see a Pileated Woodpecker in person that I pulled over, parked and followed her to another tree. She sat a few feet away focused on chipping away at the bark and eating. My presence was ignored and I was able to observe her for about ten minutes. 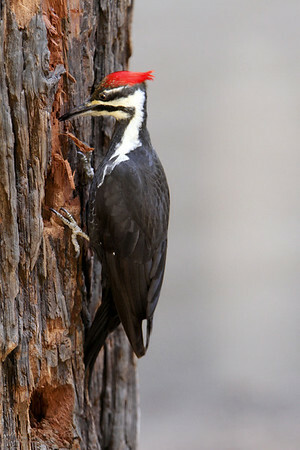 They are the largest of the woodpecker species measuring 16 " in length.